Fills the Belly, Warms the Heart! Cappuccino, Latte, Mocha, French vanilla cappuccino. Our freshly house baked sweets. All prices are subject to harmonized sales tax (HST). Please advise us if you have any serious allergies. 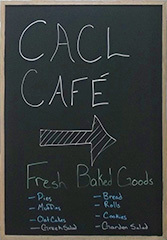 All profit from the Cafe is directed toward assisting the CACL.